Title: "Maine Woods and Water"
Wood: Maine White Pine & White Oak. 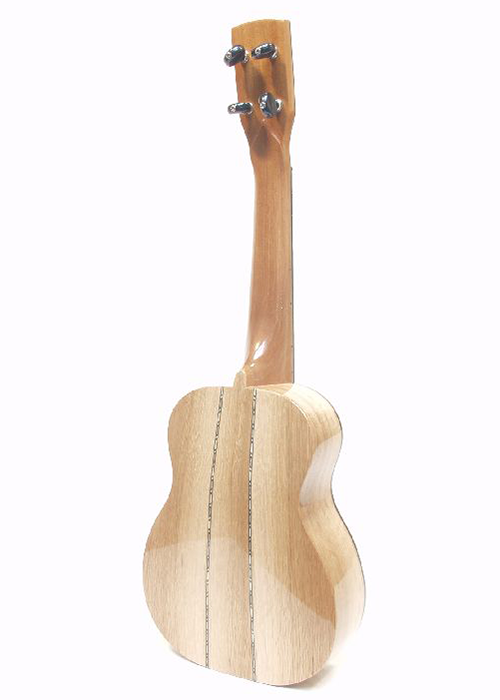 Mahogany neck, ebony fingerboard, Inlay materials are Mother of Pearl, Ivory, Ebony and Coral. I love entering juried wood shows because it provides me with an excuse to build something that I normally wouldn't think of. This ukulele started life 3 years ago when I cut some wood from our family land on Mousam Lake in Southern Maine. I dried what I had cut for a couple of years, resawed it and started this instrument. 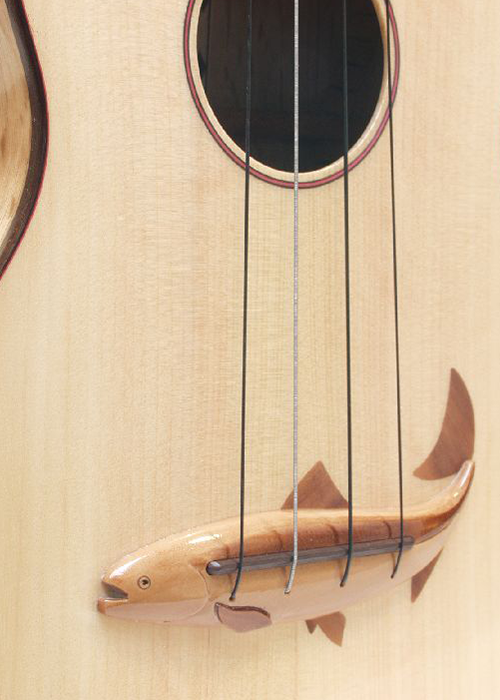 The prominent decorations on this ukulele are the peghead inlay of a light house, which is a stylization of the Portland Head Light, the inlaid fishing line and hook with its 'bubbles' fret markers and the fish bridge which looks like a Trout but really is a Dolly Varden. 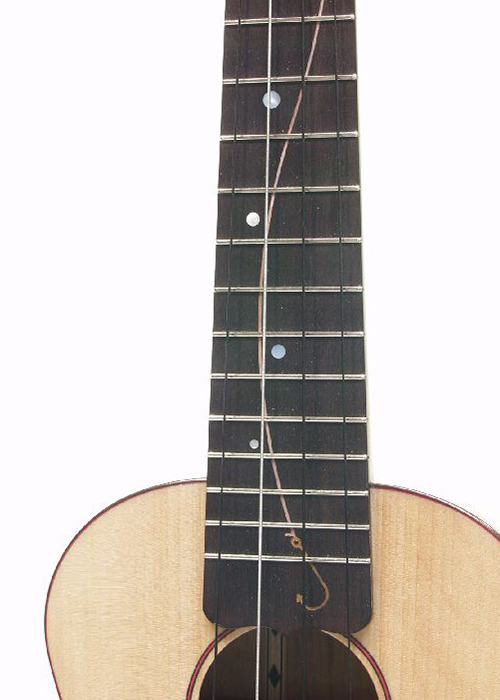 The body is bound in rosewood with a thin red purfling and the soundhole rosette is a fine lined Black-Red-Black ring. The fins of the fish bridge are inlaid into the soundboard except for the proud pectoral fin which is an overlay on top of the carved bridge. The lighthouse inlay is executed in Mother of Pearl, Ivory, Ebony and coral. It's sound is quite bright and loud especially for a softwood top instrument. With a 15" scale length the instrument measures approx. 23" overall and weighs approx. 18 oz. This instrument won two awards at the woodshow this year. First place in the "Ride the Tide" fair theme and fourth place in the musical instrument category. 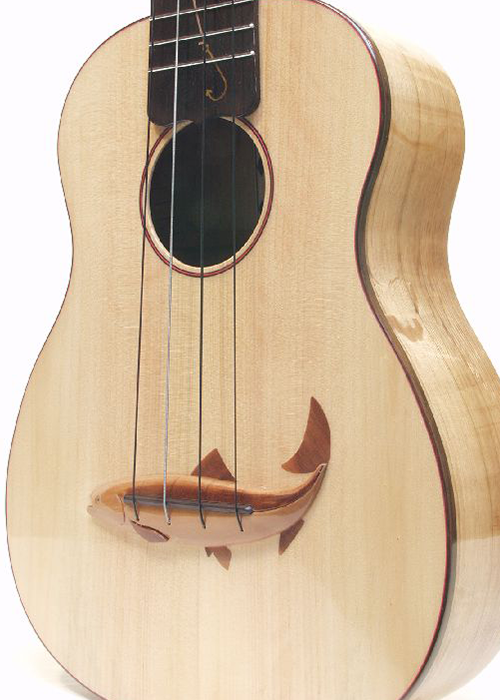 The July-August issue of 'Woodworker West' ran a story on this Design in Wood show and feature pictures of the shows winning entries, this ukulele included. This is the second time I have made it into this magazine with a winning entry!